In the early 1960s the blue uniform, including headgear, transitioned to a new and slightly updated version known as Shade 1549. The Ike jacket gave way to a long sleeve winter blue shirt with epaulettes and ties in Shade 1549. In the case of this shirt, which would continue in use until the early 1980s, epaulettes were unadorned, with officers wearing small rank insignia on the collar and enlisted personnel sewn-on cloth insignia on the sleeves. Service cap devices, "U.S." collar insignia and occupational insignia worn on the left breast had a satin nickel finish, while officer rank insignia had a mirror finish. 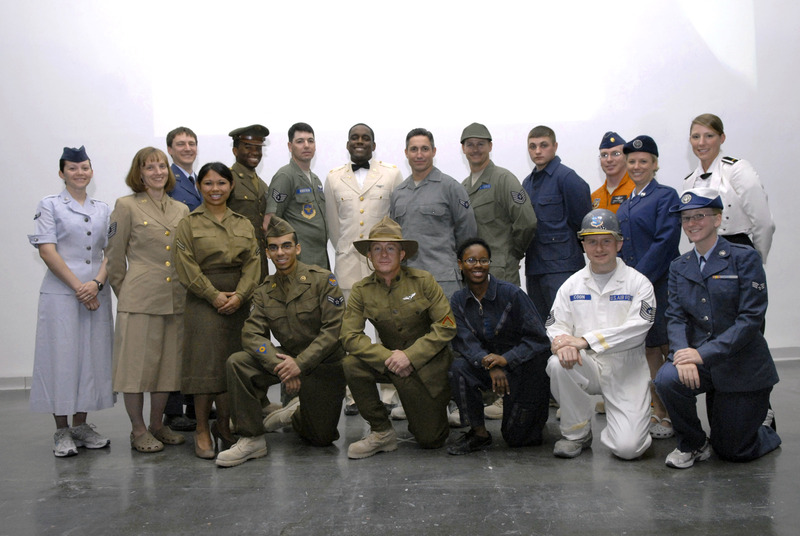 On 18 May 2006 the Department of the Air Force unveiled two prototypes of new service dress uniforms, one resembling the stand-collar uniform worn by U.S. Army Air Corps officers prior to 1935, called the "Billy Mitchell heritage coat," and another, resembling the U.S. Army Air Forces' Uniform of World War II and named the "Hap Arnold heritage coat". If the stand-collar coat was selected, it would be the first stand-collar "everyday" uniform to be issued since the 1930s (the U.S. Navy's and U.S. Coast Guard's male service dress white and full dress white and the U.S. Marine Corps' male service dress blue and full dress blue uniform stand-collar coats are worn for formal occasions only). 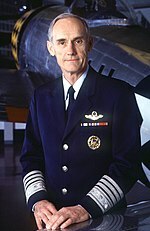 In 2007, Air Force officials announced they had settled on the "Hap Arnold" look, with a belted suit coat, but with narrower lapels than the original prototype. 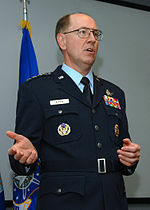 However, in 2009, General Norton Schwartz, the new Chief of Staff of the Air Force, directed that "no further effort be made on the [Hap Arnold] Heritage Coat" so that the focus would remain on near-term uniform needs. While the evaluation results of the heritage coat would be made available to the Air Force's leaders should they decide to implement the uniform change, the uniform overhaul is currently on hold indefinitely. 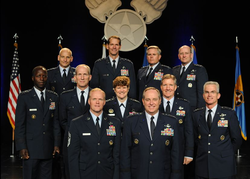 The current U.S. Air Force Service Dress Uniform, which was initially adopted in 1993 and made mandatory on 1 October 1999, consists of a three-button coat, similar to that of a men's "sport jacket" (with silver mirror-finish "U.S." pins on the lapels), matching trousers, and either a service cap or flight cap, all in Shade 1620, also known as "Air Force Blue." This is worn with a light blue shirt (Shade 1550) and a herringbone patterned necktie (Shade 1620). Metal buttons on the dress uniform were also changed at this time, transitioning satin finish buttons that employed the contemporary U.S. Air Force seal to a historically significant retro insignia that had been used by the U.S. Army Air Forces as a shoulder patch during World War II. This change was also applied to buttons on service hats retaining the chin strap and to buttons on mess dress uniforms, to include mess dress shoulder board insignia for officers. Mess dress for general officers (left) and officers(right). The Mess dress uniform is worn to formal or semi-formal occasions such as Dinings-in, Dinings-out, the annual Air Force Ball, weddings and other formal functions where civilian "black tie" would be prescribed. Until the early 1980s, this uniform differed from the current version, previously consisting of separate mess jackets, a white mess jacket worn in spring and summer and a black mess jacket worn in fall and winter, combined with black trousers and ties for males and an options of a black cocktail length or black evening length skirt for females. Black cumberbunds for males and females and white and black service hats for males were also proscribed, although wear of these hats was often optional. The current mess dress uniform in use since the early/mid-1980s consists of a dark blue mess jacket and mess dress trousers for males and a similar color evening length skirt for females. The jacket features ornate silver buttons, and is worn with the service member's awarded medals in miniature size, wings in miniature size, or other specialty insignia over the left breast, command insignia over the right breast for colonels and below (if applicable), satin air force blue bow-tie for males or tab for females, and a satin air force blue cummerbund. Cufflinks are to be either shined or flat round silver, or have the air force star and wing emblem, dark blue suspenders may also be worn, but remain hidden while the jacket is on. Commissioned officers, USAFA and AFROTC cadets, and OTS officer trainees wear hard shoulder epaulets (i.e., shoulder boards) similar to those worn by commissioned officers of the U.S Navy. Cadets and officer trainees wear insignia on their shoulder boards as applicable to their pre-commissioning rank position in their respective officer accession programs. Commissioned officer shoulder boards for colonels and below feature an officer's rank insignia in raised metallic thread, bordered by two silver vertical metallic stipes similar to sleeve braid. General officers wear shoulder boards covered nearly the entire length and width in silver metallic braid, with silver stars in raised metallic thread in number appropriate to their rank. Enlisted personnel wear the same large rank insignia that they would wear on their service dress coats. Officers also wear a single silver metallic sleeve braid on the lower sleeves of the Mess Dress coat, with sleeve braid coming in two widths, in a 1/2 inch width for colonel and below, and in a 3/4 inch width for Brigadier General and above. Enlisted personnel wear no sleeve braid. No hat or nametag is worn with the Air Force Mess Dress Uniform. The Air Force designed a new physical training uniform that became mandatory for wear on 1 October 2006. The gear consists of shorts, t-shirt, jacket and pants. The shorts are AF blue with silver reflective stripes on the leg, a key pocket attached to the inner liner and an ID pocket on the outside of the lower right leg. The t-shirt is a moisture-wicking fabric with reflective Air Force logos on the upper left portion of the chest and across the back. The jacket is blue with silver reflective piping and a reflective inverted chevron on the back. The pants are blue with silver piping and reflective stripes. The jacket and pants have since been redesigned with a lighter, quieter material. A line of commercially manufactured running shorts is also authorized for wear. 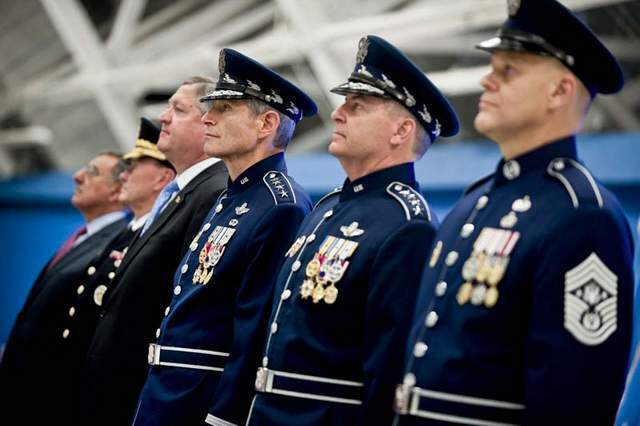 Gen. Norton Schwartz, Gen. Mark Welsh III and Chief Master Sergeant of the Air Force James A. Roy wearing command ceremonial uniforms in 2012. 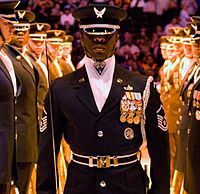 Bandsmen, recruiters, chaplains, and fitness center staff are permitted to wear the Air Force "informal uniform" while on duty. This civilian-style dress consists of khaki trousers, a blue Air Force-logo polo shirt, and solid black athletic shoes. USAF Security Forces are authorized, at commander's discretion, to modify the standard service dress with the addition of the blue Security Forces beret, white ascots with the USAF logo, and white cotton gloves. Footwear in this modification consists of bloused, spider-laced, black boots. Security Forces also wear the SF shield on the left breast pocket. Currently, CAP senior members and cadets also wear the woodland camouflage BDU with white on ultramarine blue service tapes name tapes and, white or yellow collar rank insignia on an ultramarine blue background, similar to what was previously worn by United States Air Force personnel on the since-discontinued solid green Air Force fatigue uniforms of the 1960s and 1970s. 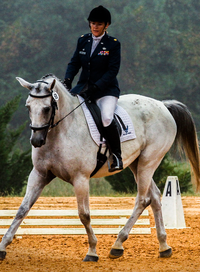 These changes are made to reduce confusion in identifying and differentiating the actual military members of the Active Duty Air Force, the Air Force Reserve and the Air National Guard versus the civilian members of CAP as the U.S. Air Force Auxiliary. With the October 2011 phaseout of the BDU and transition to the ABU by all U.S. Air Force personnel, the Air Force is in the process of determining the distinctive insignia provisions that will permit CAP to also integrate into the ABU. As with the U.S. Army and U.S. Marine Corps, drill instructors in the U.S. Air Force - known as Military Training Instructors - are authorized to wear a campaign hat. The Air Force campaign hat features the Great Seal of the United States on a silver disc. Airmen of the Band of the Air Force Reserve Pipe Band in highland dress with President Barack Obama in the White House Diplomatic Reception Room. The U.S. Air Force tartan was issued in 2001, however, the United States Air Force Pipe Band has a separate tartan designed by Strathmore Woollen Company. The ensemble, now officially known as the Band of the Air Force Reserve Pipe Band, wears highland dress, including kilt and sporran, though only when performing together. The Band of the Air Force Reserve Pipe Band is - along with the U.S. Coast Guard Pipe Band - one of only two kilted units in the United States military (other than those maintained by state defense forces and the service academies). ↑ "walking tours-Uxbridge". Blackstone Daily. http://www.blackstonedaily.com/Outdoors&Nature/WTuxbridge.htm. Retrieved 23 September 2007. ↑ "Formal unis for top 2 leaders bring controversy". Air Force Times. 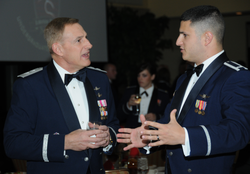 http://www.airforcetimes.com/article/20120828/NEWS/208280348/Formal-unis-top-2-leaders-bring-controversy. Retrieved 1 January 2014. ↑ Nauman, Robert (2004). On the Wings of Modernism: The United States Air Force Academy. University of Illinois Press.